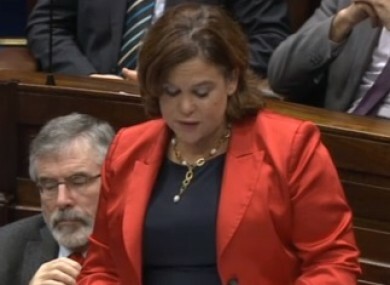 Mary Lou McDonald speaking in the Dáil this evening. THE DEPUTY LEADER of Sinn Féin, Mary Lou McDonald has said the IRA should never have been involved in investigating allegations of abuse. “But they were,” she said. Speaking in the Dáil this evening, McDonald said the “rough justice” is not a substitute for the justice that victims of abuse should have received. Maíria Cahill took that brave decision. She said that anyone that covers up abuse should face the full rigours of the law, stating that there should be “no exceptions to this rule”. She wanted to be clear that this meant no one in any group, “and that includes republicans and former members of the IRA”. She stated that she believed they could “get to the bottom” of the matter and encouraged anyone who had suffered abuse to come forward. Speaking about the allegations made against the Sinn Féin Party that they have been involved in a “cover up” to shield child abusers, she said “this is not true”. She said this allegation is being commonly repeated and that no matter how much it is repeated it will never be true, she said. “I am a mother of two young children and I would walk through the hot coals of hell to protect my children,” said McDonald, stating that she attaches the same sentiment to any other child and their welfare. Making such accusations makes the other political parties “hypocrites”, she claimed. McDonald said the state denied abuse that was “carried out on their watch” and begrudgingly gave a “half-hearted” admittance to it, adding that they “chased victims through the courts”. “I believe that matters can be resolved and must be resolved for every victim,” she concluded, reiterating her call for people who have been abused to come forward “without delay”. Speaking earlier on the RTÉ Six One News, Maíria Cahill said it was “pretty despicable” that Gerry Adams had the opportunity to “tell the truth and didn’t do so”. She called on Mary Lou McDonald to confirm that an internal review had been carried out. Email “Mary Lou says she 'would walk through the hot coals of hell to protect children'”. Feedback on “Mary Lou says she 'would walk through the hot coals of hell to protect children'”.